As medication experts, independent community pharmacists provide counsel on the treatment of a variety of health related concerns and reduce overall costs by helping to ensure that patients consistently take their medications and by referring them to generic treatment options when appropriate. Independent pharmacies provide a variety of niche services, often unavailable elsewhere, to meet specific health needs. The top services offered include same-day home delivery; medication therapy management (MTM); immunizations; compounding; and durable medical goods. In addition, these pharmacies are often located in underserved rural and inner city areas where access to care is a challenge. There are an estimated 21,909 small business community pharmacies. A slight decrease from the 22,041 stores estimated in 2016. Approximately 1,800 rural independent pharmacies serve as the only pharmacy provider in their community, with the next closest pharmacy many miles away. 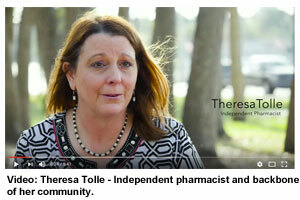 Consumers credit independent community pharmacies with providing sterling customer service. Patient surveys conducted by J.D. Power, Consumer Reports and others. Patients are a name, even family, at these pharmacies—not a number. Independent pharmacies are also consistently price competitive for prescription drugs, according to surveys conducted by media outlets, including Consumer Reports, PBS "Newshour", WKBN-TV and KMOV-TV. 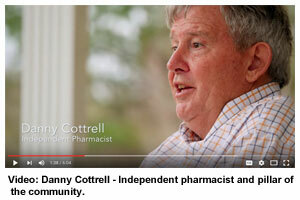 See what one independent community pharmacy owner did to stimulate the economy of his hometown (click on the picture at right) and scroll down to see other ways independent pharmacies are involved in their communities. Independent pharmacies employ approximately 240,000 people on a full or part-time basis. About one-third of all retail prescriptions are filled at these local small businesses. To learn about the challenges facing independent community pharmacies today and solutions to address them, please visit our Advocacy web page.